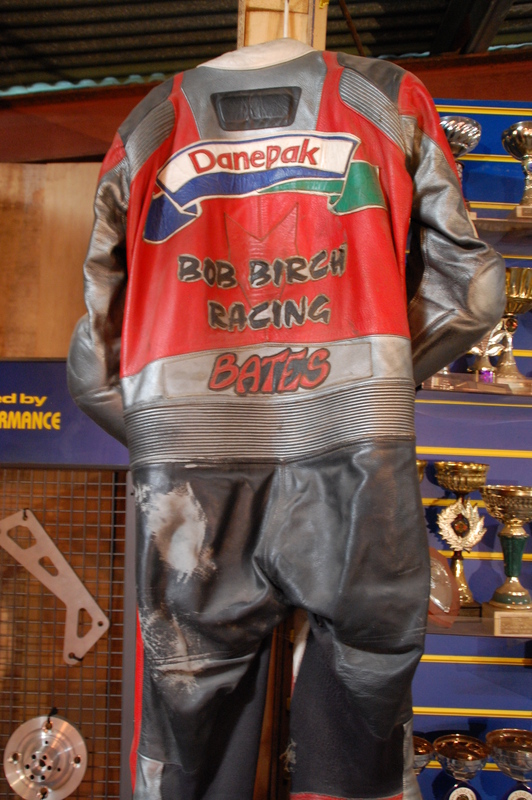 Andy Bates has been famous in the world of bike-engined motor racing for the past 20 years. 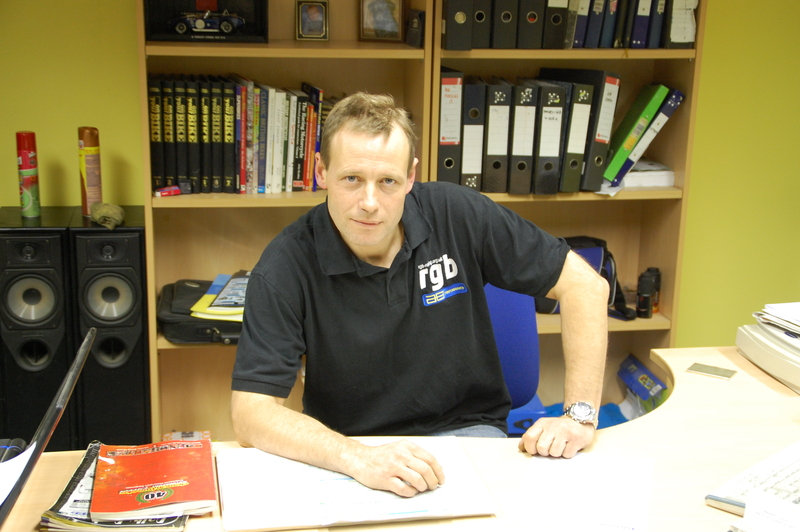 Whether it’s on two, three or four wheels and propelled by a high revving, rasping motorbike powerplant, chances are it’s been fettled by Andy’s AB Performance business. But a recent appearance on the BBC’s Dragons’ Den catapulted Andy into a broader limelight and saw him achieve what so many strive for yet fail to accomplish – a financial investment by car and racing enthusiast Peter Jones. 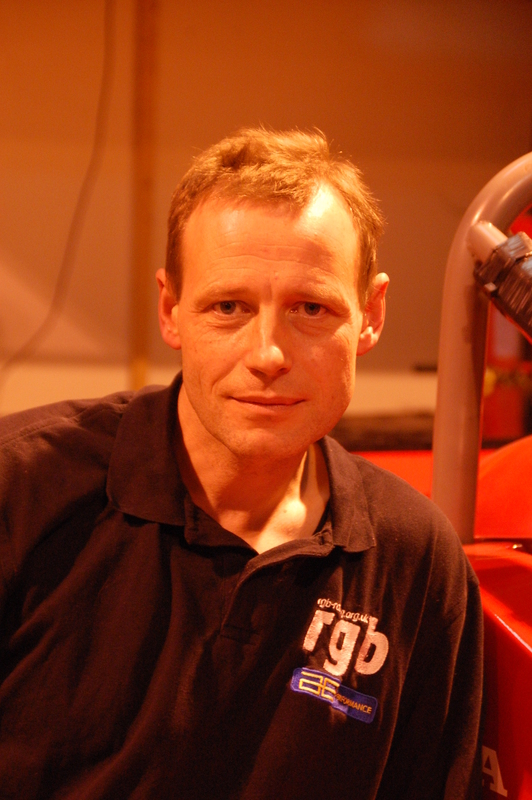 I ventured down to AB Performance’s engineering works in rural Suffolk to meet Andy to find out more about his personal journey, his Dragons’ Den experience and plans to take his company to new levels of growth. Keith Jones: Hi Andy, good to meet you. To be honest, I wasn’t really expecting the set-up to be quite this big. It’s very impressive. Andy Bates: Thanks very much – it’s great actually, nicely out of view from the road with plenty of space out here in the country, so I’m not paying the higher rates you tend to get on industrial estates. As you can see, it’s an old barn so it’s got loads of space inside and I’ve built things in as and when I needed them. 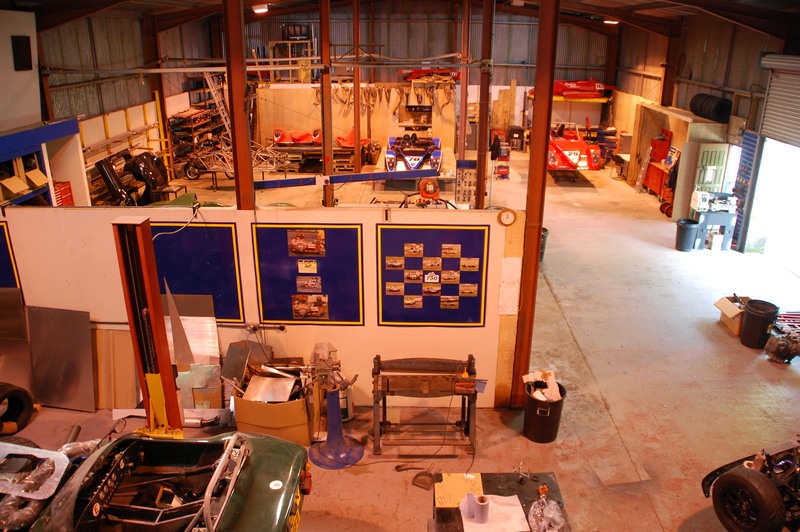 So, we’ve got bays here for building engines, chassis fabrications and so on, lots of open space on the workshop floor and up above I’ve got my office, a meeting area and a stock room. It’s exactly what I need. 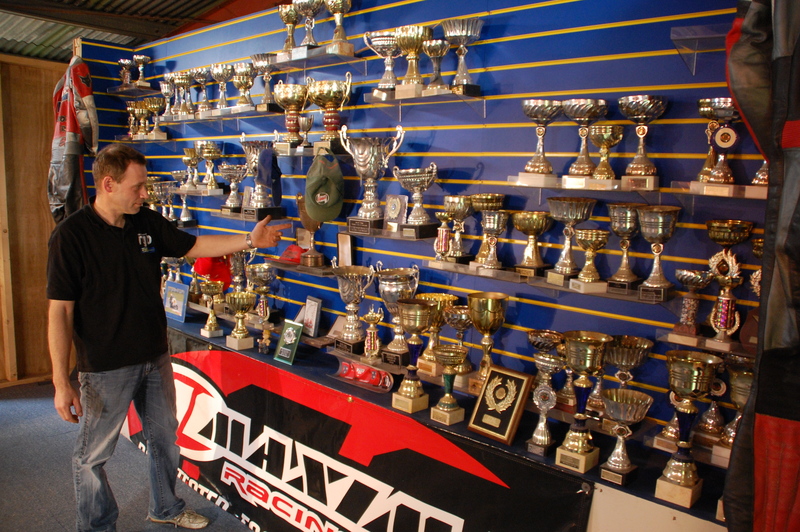 KJ: Is that the meeting area up there with all the trophies on display? AB: Yeah, come up and we’ll have a chat over a coffee. KJ: Now, while you’ll suddenly be more familiar to a lot of people after your recent TV appearance, the trophies alone show you’ve clearly had a very fruitful track career before going into business. How did your life pan out in the days before AB Performance? AB: Well, I essentially had two careers. Firstly, in order to pay the bills I had my career in the Fire Service, a job I loved. I joined straight from school, learned the ropes over time and worked my way up through promotions. But while I loved the variety of not knowing what you’d face each day and the camaraderie of the Watch, it wasn’t my passion – racing was. 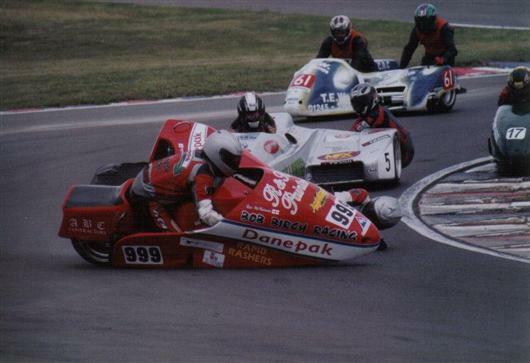 I’d raced bikes and cars but 1988 was when I switched to sidecar racing, which ultimately became my most successful period as a competitor. KJ: An unusual change of direction – how did that come about? AB: Like most life-changing opportunities, I guess – by chance. I was interviewing a guy called Phil Underwood who’d come to the station for a position as a Retained Firefighter. He was already working as a Fire Officer for the Ministry of Defence, so it seemed a natural progression. As happens, conversation turned to out of work interests and he mentioned that he raced sidecars as the driver and was looking for someone to be his passenger. Before I knew it we’d arranged a test. KJ: Presumably you were hooked straight away? AB: Yeah, definitely. It felt great and what helped was Phil was such a great driver and I was quickly able to learn his style and read his body language so I knew which way to lean when he was going to overtake, or whether I’d need to tug on the fairing to help it steer round a bend. It was a strong and successful partnership. What was clear in the early days was a lack of set up and engineering expertise, which I knew I could bring to the table. KJ: So was success instant? AB: Not far off to be honest. I handled all the engineering side of the partnership while Phil ran the business side of it. We quickly became very successful from that first season together and walked away with the championship after numerous wins. And each year just got better and better, as we moved further up different categories. Success just kept coming our way. We also effectively created a new class of sidecar too. KJ: Like a new Formula within the sport? AB: Yes, there was quite a sizeable gap between the top flight category of sidecars and the rung of the ladder below. Those world championship sidecars had huge amounts of power but a long, unwieldy chassis – the group below being the other way around. So we created a halfway house if you like. It had the shorter, better handling chassis with a more powerful engine. With nearly 200hp, those things were bloody fast. Bryan Pedder, one of our main competitors, came up with a similar concept shortly afterwards and between us we dominated the field. KJ: So, did this springboard you and Phil to the highest echelons of sidecar racing? AB: Almost – had we not had that massive off at Oulton [Park] then I’m sure we would have been there. Up to that point we’d had multiple championships and literally so many wins I’ve lost count. KJ: Yes, you mentioned something about a big accident in your Dragons’ Den pitch – what happened? AB: I’ll give you the shortened version as my memories of that day are very clear and vivid. Basically, we arrived at Oulton needing two second places from the day’s pair of races to clinch the championship. Our main sponsor’s senior management had come over from Denmark to see the fruits of their investment, if you like, so there was a bit of added pressure, but we knew what we needed to do. In the first race we finished a solid second and whilst the guys from Danepak were pleased, we were informed a win in the second race would be even better. Pole position in that second race helped but it was halted very early on after a fatality. Whilst that crash was investigated we had a bit of time to make changes. I wanted to change the clutch because I was worried that we’d get bogged down at the re-start and lose our advantage if we didn’t. Phil didn’t want it interfering with in case changing it created a new problem, so it was left alone. So, there we were, pole for race two, lights go out and… whoosh, first place on the grid suddenly becomes seventeenth by the first corner. KJ: What happened – did you get caught out by an amateur at the back? AB: No, no, far from it. We had a great race, really exhilarating and we were up to second with just five laps to go and catching the leader too. Going through Clay Hill, a little faster than before, the sidecar’s outboard wheel bounced off the rumble strip on the kerb and threw me into the air, totally free of the machinery below me. Somehow I landed right back down on the platform, grabbed on and momentarily thought ‘got away with that’. Then I realised we weren’t facing forwards anymore but were approaching the end of an almighty slide into a wall. Bang! I spent the next six months lying on a hospital bed. KJ: How bad were your injuries? AB: Bad enough to end both my racing and fire service careers there and then. I was fortunate enough to be wearing really high quality armoured and padded leathers, but the sidecar passenger can only wear the partial back board, because the full ones the drivers wear are too cumbersome to move about with. The result was my neck bent backwards over the top of the board cracking my T1 and T2 vertebrae and fracturing T4 and T5. What didn’t become evident until my back was healed was my damaged knee, where I’d badly damaged my cruciate ligament. It took several attempts to fix with surgery, bolts and who knows what, but eventually it got to a stage where it was useable in day to day life – just not strong enough for a career as a Fire Officer. It was now 2004 and the appeal of a desk job was very, very low. So I decided to do something else. KJ: And this was when AB Performance was born? AB: Yes, from humble beginnings, that was the start of it, back in 2004. I knew the other thing in my life I could do well was working on bike engines and setting up racing machinery. So, I bought a used Fireblade engine for £400, stripped, tuned and sold it on for a profit. The guy who bought it fitted it to his previously mid-field car and walked away with the championship, which naturally generated some early brand awareness for AB Performance. With the profits from that first engine sale, I bought two more, did the same, and bought two more and so on. With it came the add-on sales in terms of servicing, setting up and then further engineering work. Before long I was being asked about whether I could supply devices like paddle shifts for the gear changes. So I designed one and started to sell those. Then a new prop shaft design. The work and requests kept coming and because AB Performance is a proper engineering firm I obliged however I could, growing the business organically to suit the needs of the customer. Before I knew it, the business had grown to become one large enough to manage the whole process of fitting bike engines into cars – hybrids as I call them. KJ: [Laughs] Not in the Toyota or Honda sense of the word ‘hybrid’? AB: [Laughs] No, no electric propulsion here. All high revving, petrol drinking bike engines. KJ: Eventually though the passion grew so much that building your own car became the next logical step? AB: Yes, the passion and also the fact that every race weekend I’d be moaning to my mates down the pub about poor installations that I’d seen that day and they’d be badgering at me to “go and build your own car then.” Three and a half years later, the first Sabre hit the road. Well, the track. I did all the CAD design work, designed a fully-triangulated spaceframe chassis that we build ourselves, have the body work fabricated by a glass fibre specialist in the unit next door and all the final assembly work is done here too. 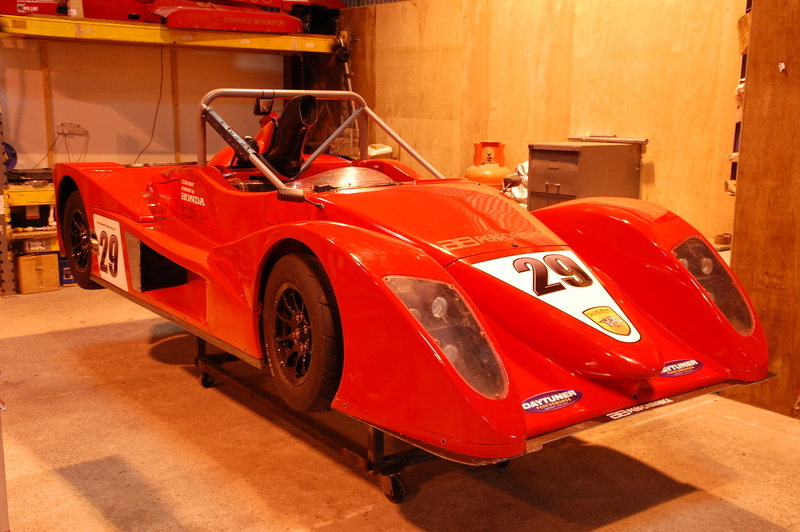 Using all my experience with bike-engined cars has meant the Sabre is easy to work on, incredibly strong, fast, reliable and above all when buying a racing car, successful with a proven track record. KJ: And it’s road legal too? AB: Yes, road legal. All the necessary lights, body work radii and other legal requirements are met in order to pass the IVA [Individual Vehicle Approval] test, although the customer usually requests them to be put back to track specification soon after! To be honest, while they’re road legal, not many bike engined cars make for good road cars. Bike engines work best at high revs, so around town at 2-3000RPM, they can be lumpy in their power delivery. KJ: How many people work at AB Performance now? AB: Three, including myself. Nick’s a former F1 engineer who has previously worked with Benetton and Toyota’s programmes and we have a young lad, Tom, who we’re showing the ropes to – he’s effectively having an old school apprenticeship. KJ: And looking around the works now, not only are you producing Sabres but you’re converting other cars for track use too? AB: Yes, that’s right – let’s go back down onto the shop floor and I’ll talk you through some of the things we’ve done. Going back down the stairs from Andy’s trophy display reveals both the full extent of his work in progress and the fact this is a proper engineering firm, not simply an outfit where off the shelf parts are installed to replace worn out components on a like for like basis. Andy demonstrates on a bike-engined Striker (a front-engined track car with a passing resemblance to a Lotus 7) how the bike’s original airbox is modified to fit to a plenum chamber manufactured on site so it fits below the bonnet line, and how following customer requests, the milled aluminium paddle shifts for the gearbox are now anodised to prevent surface milkiness. KJ: Andy, that looks like a racing sidecar but the lights and number plate suggest it’s road legal. Is it? AB: [Laughs] Yes, it is. It’s a beast isn’t it? The lights have been installed and the ride height raised in order to deal with the roughness of many roads but yes, you can ride it on the road. The platform area’s similar in size and layout to what the racing machine would have too. KJ: Presumably you do a lot of bespoke work? AB: Yes, we do. Some of it has a familiar feel though because it could be a chassis we’re used to working with and installing an engine we’ve done several times over, but each hybrid programme we carry out is unique. I spend ages on the phone and on email beforehand ensuring we fully understand what the customer wants and advising them if a bike engined application won’t actually produce the result they’re after. I’d rather have a smaller number of thoroughly satisfied customers than to take money off everyone who comes waving a chequebook only to be grumbling afterwards about how we didn’t produce what they expected. It’s vitally important to protect the brand and our reputation. KJ: Other than the track-to-road sidecar, have you undertaken any other bespoke packages that might be considered ‘wild’? AB: Is a bike-engined Reliant Robin wild enough? AB: [Laughs] No, not at all – we finished it the other week. Took out the 850cc Reliant engine and installed a 160hp Fireblade unit. When the guy who ordered it came to collect it he initially daren’t get in it even as a passenger! Not sure whether he regretted what he’d asked for but it was manic. It wanted to pull wheelies on every upshift! KJ: So, you reach a certain level of success with the company and you encounter the next level of ambition. I guess you explored conventional methods of business finance before applying to go on Dragons’ Den? AB: Well, I did and I didn’t. I knew I needed a cash injection to get the Sabre into larger scale production, as well as to build and maintain a demonstrator model we could take to tracks and offer to interested parties to help generate further sales. But the cash alone wasn’t the only consideration, I wanted someone who was passionate about the business and racing too. With the best will in the world, bank managers tend to not get personally involved with their investments. So, back last October or November, I was on my stepdaughter’s laptop doing some work and various pop-ups kept appearing on screen, one of which was to apply to be on Dragons’ Den. It was about 2am and I needed a bit of a distraction, so filled it in and left it at that. In fact, by the time I got a call to go and audition in February, I’d forgotten I’d even applied. The audition went successfully and at the start of May I received a call saying if I was still interested, I’d be filmed in a fortnight’s time for the show proper. KJ: Which meant as well as ensuring the business ran as smooth as ever you also had your pitch to prepare and those all important sales figures and projections to commit to memory? AB: Definitely – it was a fortnight of very late nights, poring over figures and so on. But, I knew the business inside out, I knew what I specifically wanted the investment for soon it became second nature. I also knew I could talk confidently about the business – the part I didn’t know, and couldn’t know until the day, was whether the Dragons would feel AB Performance was investment-worthy. AB: The pitch itself is limited to just three minutes but I had the best part of two hours of questioning by the five of them before I agreed a deal with Peter Jones. KJ: You talked about a passionate investor earlier – presumably Peter was the guy you were hoping would invest with his love of cars and motor racing? AB: Yes, it worked out perfectly in that regard, although he gave very little away until he made his offer, so I couldn’t read it at all. Taking the Sabre along for the pitch no doubt helped, so I was pleased when he climbed aboard. KJ: And this number 29 machine is the one used on the programme? AB: Yes, looking a little battle-scarred from a close season of racing, but this is the one he sat in. KJ: So, what’s the stage the investment’s at now – has due diligence been completed? AB: Well, it starts off shortly after filming with a huge list of questions from Peter’s team. I replied to all those and then got a shorter list of questions back. This goes on until there are no more questions to ask and they’re ready to issue a contract. That’s the stage we’re at now, so my solicitor will be going over all the details. Once that’s done, we’re all systems go. KJ: Are you able to reveal anything of the plans you have for the money or what Peter intends to do as part of his investment and involvement? AB: Well, yes and no. What I can tell you is that the demonstrator and productionisation that I went in specifically to pitch for are now already underway, because this isn’t an industry you can stand still in. We’ve had approaches from a party in the USA who are interested in setting up a Sabre one-make championship over there because they can see the advantages of an inexpensive and close racing series. And, we’re in discussions with a Spanish group who are looking to buy several Sabres to use at a racing driver academy out there. 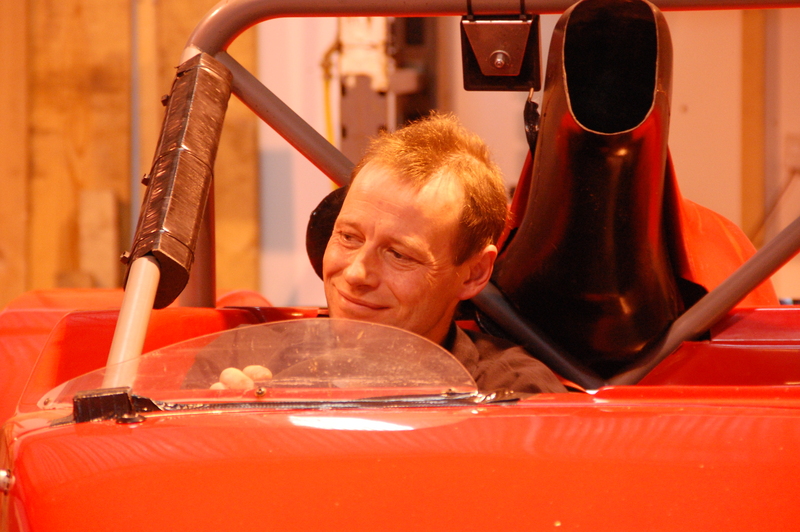 The chassis is wide enough to allow for the driver and an instructor to be sat by their side. But as for Peter’s specific plans, I have an inkling, but as you suggest, I can’t say even if I knew. KJ: And how’s life changed since your appearance? I saw on the Monday after it was aired you’d tweeted that normally you had 500 website hits per day but that it had rocketed to 160,000. AB: It’s been crazy. Good crazy, but crazy nonetheless. My Blackberry just kept pinging with emails on the Monday morning – had over 1500 by the time I got to the office. The phone rings almost constantly too. But I’ve had further offers of investment, lots of CVs sent through from people asking for jobs and requests for interviews, including one on Radio 5 Live where I had a cameo appearance in the middle of a discussion about religion. Oh, and lots of free pens from companies offering to produce promotional giveaways for me. I’ve even been asked to give a speech to a school’s Sixth Form! Keep a close eye on the bike-engined car world. With Peter Jones’ investment behind him, Andy Bates and AB Performance are edging closer to becoming household names.